A Scouser who became the first man to travel to every country in the world without flying now has a book out to explain his unique story. 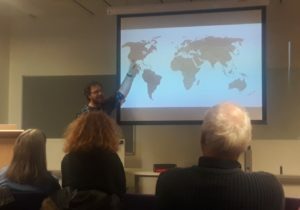 Graham Hughes came to Liverpool Central Library on Saturday to promote his book, ‘Man of the World: The Odyssey Expedition,’ which covers the first year of the journey. ‘Man of the World’ details Mr Hughes’ travels through South America, hitch-hiking across the Caribbean, getting locked up in Africa twice, while visiting 133 countries in 12 months. Graham also had some advice for aspiring travellers. He told JMU Journalism: “Don’t wait for someone. A lot of people say ‘Oh I’ll find someone to go with me and then I’ll go.’ The thing is if you go on your own you’re never alone for long. There are always other people on the road, people who want to meet you. Mr Hughes, who hails from West Derby, entered the Guinness Book of World Records after taking just over four years to visit every nation on earth without resorting to flying. The trek was not without complications. In 2011, a new country appeared on the map as South Sudan was recognised, forcing the 39-year-old to travel back through Africa. He also had to revisit Russia after it was ruled he had entered the country illegally. Sarah Clarke, 49, from Wirral was in Central Library to hear the talk and said she was “blown away” by Graham’s adventures. ‘Man of the World: The Odyssey Expedition’ is available now from major book outlets.